Hello there! In the previous post we had a look at how best to Secure your blog. 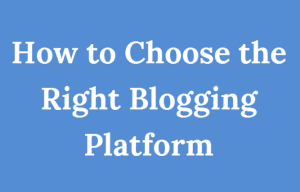 Hopefully you have already implemented this step, since it's critical for your blog’s health. Also before you implement money making techniques on your blog it's imperative you secure you blog to ensure your earnings are well protected. So we have finally reached the most exciting part of making your own blog. Techniques to make money from your blog. This is what you had created your blog for, done all the hardwork for, its time to get your hands on the money ! The most popular, easy to implement and quickest to start generating income, nothing works like running ads on your blog. You have the audience who advertisers want to reach out to. So your blog becomes the perfect medium to bridge the gap between audience and advertisers. since you are bridging the gap, the advertisers pay you for your help, and that's how ads on your blog will bring in moolah for you. They will process your application, and review it. Once your application is approved, the ad network will provide you with a code. Ads began to show on your blog. 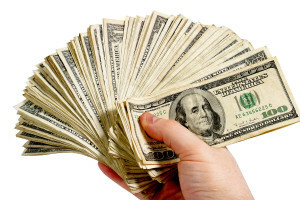 Every time somebody clicks on your ad, you get paid. Your only responsibility is generating traffic, no bother with marketing or designing. They offer very less control, you cannot choose how much you will earn per click, what type of ads will show, or how often it shows up. You need good amount of traffic to make money from this monetization option, because only a small amount of visitors to your blog will click on ads. So the more number of visitors you get the more clicks you will get and better you can earn. So earning from this is dependent on your blog traffic. A major problem with PPC advertising is banner blindness. Banner blindness occurs because visitors become so used to seeing adverts, that they glaze over the ads. This phenomenon causes loss of clicks thus affecting your earning from PPC ads. Placing ads in prominent positions, grabs your audience attention. This motivates more viewers to click on the ads. More clicks = higher cost per click = more money for you. Make sure you do not compromise on audience experience by placing too many ads, or placing them in a manner that will disturb the reading experience of your blog. Poor reader experience = loss of visitors = fewer clicks = less revenue for you. If using Google AdSense make sure to choose the right option under the ‘block ads’ section. This will help you in regulating the ads displayed on your blog to some extent at least. Do not overdo the blocking, since that might have detrimental effect on your earning. Fairly easy to implement. Requires efforts in terms of marketing. Earning from affiliate marketing is totally dependent on your efforts. The better your marketing skills the more you can earn. People want to sell product, you have the audience who can buy the product. You bring the product to your audience, make a sale earn commission on it. Neat way to make money from your blog. Explore your niche, and find which are the best affiliate providers in it. From amongst these pick up those that you have personally used or are confident enough about to endorse them. Promote the hell out of this post/review, the more people buy the more you earn. Its a great source of generating passive income. once you have created the post/review you only need to promote it, no additional expense/effort in it from your end. You will need to keep working on increasing your viewers, because established viewer might have already purchased a product and hence will not boost sales. Keep adding new affiliate products. To make money from loyal audience, adding new product is important, because they might have already purchased a product that you are selling. So new product = new sales = more money for you. Do through research, spend sufficient time on finding the right product to sell. Do not blindly follow what others are selling, do your own research. Try to locate less popular but more useful products, in whose potential you have faith and work on promoting them. Always check 2-3 networks, to find the best commission deal. And make sure to check with the product seller directly as well to get the best deal. Always use the product you promote. This way you know its ins and outs and can confidently promote it to your audience. Research your niche to find any unfulfilled need, create to fulfill this need. Alternately you can research current product offerings for a particular need and design a product superior to those being currently offered in the market. This product can be in form of video, Ebook, software, course, etc. Spend adequate time in creating and designing your product. Always beta it before introducing it in the market. Do numerous dry runs to eliminate snags from the system. Research and have in place a system of providing customer support, this would be applicable for digital products like softwares etc. Once your product is ready, introduce it in the market. Make sure you create a strong marketing program to ensure that your product gets the best possible exposure and traction. In case you are not interested in designing your own product, or can't really come up with a product idea, you can choose to sell off somebody else's digital product. This method offers maximum control and maximum money making potential. You can design a product based on audience research and feedback. Determine a need and design something to address that need. Since you design and own the product, you are in full control of quality,content, designing, features; all the aspects of the product. Also you can choose how to price your product. All the money that you earn from sales of your own digital product, comes to your account only. No middleman no commission. Selling your own product gives you recognition in your field, as an expert. From designing to marketing everything is your responsibility. To make a successful product you need to have top notch designing as well as marketing skills. Somehow most designer lack in marketing aspect, or vice-versa. A successful product requires continuous improvement and updation. You need to put in time and effort to keep your product current or sales will dry up over time. If selling other’s digital product your income share is limited to the commission amount and it carries all the risks associated with affiliate marketing. Expand and increase your product line as per customer feedback. You are already proving a lot of quality content to your audience via your blog. All this content you are giving out for free, not charging your audience a single penny for gaining from your knowledge. This is called the Free model. If you charge money for all your information its called the premium model. Membership sites work on the Freemium model, which is a amalgamation of the Free and Paid model. Here you provide free content on your blog, and also create a member only section where you provide exclusive resources to the members only. For this membership you might charge in a monthly/yearly or maybe even one-time. This way you can earn more from your knowledge. Post lot of quality content on your blog, make sure you are providing valuable information to readers. Once you have a sizable audience float the concept of member’s only area where you will share your premium content. This might be in form of tutorials, videos, lists, Q&A etc. Choose a membership management software that you feel comfortable working with, integrate it into your blog, or you can choose to host it on a different domain altogether. Get your membership site going, add resources to it and advertise it to your audience aggressively in order to gain maximum member’s and develop a steady stream of income for your blog. This works well in niches where things are constantly changing, and audience will be interested in keeping up with the changing scenarios. Since you own the membership site, you can easily control its quality, and value addition thus making sure your members are happy and bring in more referral members. You get to earn money from your knowledge, unlike in the free model where you are sharing all your knowledge for free. Maintaining a membership site requires tremendous dedication, as you should be able to provide consistent quality content to the members on regular basis. You need to be on your toes, regularly updating your knowledge base so as to provide your members with the latest information and strategies. You need to be a pro in your field, or else you might end up with a site where members know more than you. Try to increase your members, and encourage communication amongst them, this way you will not be the only one dispersing information and this will allow you to keep the members engaged as well. Include some reward/recognition system into your membership site, this will encourage members to interact and be more proactive in your site. This is a fairly popular and commonly used monetization method in blogs across all niches. Its fairly similar to running Pay – ads are shown, per-click Ads. However the main difference here is control. While you cannot determine what type of ads show up on your blog, and how much you get paid for them in PPC; Private ads are just the opposite. You choose which advertisers you want to work with, what ads are shown for how long and how much you get paid for them. Determine where you want to place ads (ad space) on your website/blog. Also set the price you would like to charge for each ad space, it can be on per week/month or quarterly basis. Completely your choice. List your blog on different websites, where you will need to provide all the details of your ad space, and other essential profile information. Once done, advertisers will approach you themselves, and you can choose to work or not work with them as per your discretion. You can also create dedicated Media Kit/Advertise with us page on your blog on your blog/website specifying your banner advertising guidelines and rates. This will enable advertisers to directly contact you. It is a relatively steady source of income, since you will be deciding the ad pricing and its duration. You have complete control over the ads shown on your website/blog. This helps you ensure that your reader’s experience is not compromised by pointless ads, but instead enhanced with focused and targeted ads. Your blog needs to be reasonably popular for monetizing through this route. Sizable traffic gives you the bargaining power with advertisers to set your own rate. Finding the right advertiser and negotiating the best prices requires some skills. So the earning potential will depend on your research and marketing skills. unlike PPC ads are not regular. Once a advertisers time is up, he/she may/may not choose to renew the ad space, this makes your income from this source a tricky one. Study your competitors and see which companies advertise on them. Contact these companies directly and individually about selling ad space on your website. This way you can eliminate the middleman and earn more money from your blog real estate. Play the psychological game right. If you see a shop with lot of customers, and next to it a shop with very few customers, your automatic perception will be that the shop with more customers is more popular, hence it must sell better product, and hence you will be tempted to visit this shop even if the shop with fewer customer might be offering better quality. This same psyche comes into play when you are trying to sell your ad space. Project a high fill rate. Show your affiliate banners on your unfilled ad spaces, and just leave your smallest ad space free, marked as ‘place your ad here'. If you are a Pro in your field, then you can provide professional services in your niche to customers. A fashion blogger can provide personal shopper services, a financial blogger can provide financial planning services, and so on. If you know your niche well and are an expert in your area, then you can use your blog to showcase your skills and make money from them. This is a great way of using your blog to make money online/offline depending on the type of service you provide. Study your market to find which service is most sought, design your service offering around this requirement. You can also ask your audience which service would they be willing to pay you for. Design a service, consultation or training as per the market requirement. Refine and package your services in the best possible manner. Create a dedicated page on your blog providing the details of your services. Add in the page a way to contact you, as well as your pricing information. 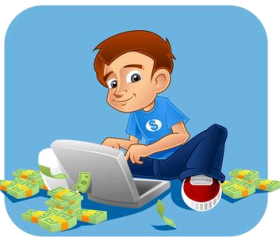 You are all set to make money from your blog via Freelancing. You have full control of this process. From deciding your own charges to choosing who you want to work with. This monetization technique does not depend on the amount of traffic your blog receives and hence its a excellent way to make money for new bloggers with relatively lower traffic. You can choose to take this offline, by offering services in the physical world and taking it beyond the virtual. This income is not as passive as some other blog monetization techniques, and you will need to actively work on it. Income from this method is limited by your resources. You can do freelancing work during your waking hours only, whereas income from methods like PPC continues to accrue even in your sleeping hours, since it does not require any intervention from your end. You need to work hard on promoting your services. Marketing skills are a must. If you are new to blogging but have good experience in the field you are blogging about, selling your services like coaching, consultation, guidance etc works well. Through your blog showcase your talent and expertise in order to attract clients and prove them your credentials. Register yourself as a Freelancer on the different freelancing sites, make sure to link your blog to your profile to build your credibility and showcase your skills. This is a relatively new way for bloggers to make money from their blogs. This technique works best for blogs with large social influence and good amount of loyal audience. Once your blog has large audience base, a post on your blog get exposure to lots of potential buyers for businesses in your niche. This exposure will turn into sales/participation/traffic or social chatter about their brand/product. This way they can reach out to a large audience in one go, and via a trusted source. Hence Sponsored posts are gaining popularity amongst companies looking to advertise. Companies/person pays you money to write about him/her/their brand/product/initiative etc on your blog. So basically you get paid for writing post on your blog. Quite simple isn't it. – Post to gain SEO advantage. I strongly advise against taking up any SEO advantage post. How much ever maybe the money involved. SEO advantage post are against Google guidelines, and endanger your blog's ranking and listing on Google greatly. Post for gaining visibility are completely safe, and if they fit in with your audience they create a win win situation. Client wins by gaining exposure to your audience, you win by earning the money, your audience wins by coming to know about a new product/service/person/initiative. Create a Page on your blog explaining that which kind of sponsored post you accept, how can companies reach you for the same, and what process will you be following. Provide dedicated contact information so that companies can get in touch with you and negotiate the details easily. This is a great way to earn money from your blog. Once you build a large enough audience base, sponsored post can start coming your way automatically. Some niches lend well to sponsored post. Niches like travel, fashion, shopping, food etc; where the bloggers hold significant influence over the audience and can sway their purchase decision. You cannot do too many sponsored post, or your audience experience will start getting affected, and in rare cases might lead to loss of visitors. hence income from this mode of monetization is limited to the number of sponsored post you can do per month. Ensure that the sponsored post page is easy for advertisers to locate and contains all the relevant information, along with a dedicated contact point information. Whenever doing a sponsored post, make sure you mention in the post, that it is a sponsored post. This will ensure that you maintain complete honesty with your audience. create your profile on sponsored post sites. These sites work on bringing bloggers and advertisers together. So once your profile is live advertisers can contact you directly. Also you can browse through the list of advertisers looking for a sponsored post, and if something matched your niche and audience,apply for their project. You can also read this wonderful post CAN A BLOG MAKE MONEY WITHOUT ADS AND/OR SPONSORS? By Joyce. After Offers When user signs up for your email, other similar blogs are shown to them. If user sign up for them you earn money. 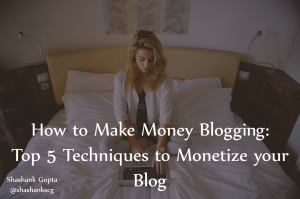 A great passive way to monetize your blog. Google sends all kinds of traffic, and many a times this traffic is not so relevant. This adds up to your website’s bounce rate. How about making some money from this bouncing traffic. Use WP Bounce to display related products from Amazon with your affiliate code. If the viewer buys any product you can earn money off the bouncing traffic as well. If your blog uses lot of captchas, this is a excellent monetization method. It takes an average user 14 seconds to solve a captcha. Some enterprising marketers have found that 14 seconds is long enough to advertise. All you need to do is place the relevant code on your blog, and sites like SolveMedia, Confident CAPTCHA, NLPCaptcha will do the rest, making sure you earn money every time a user solves a captcha. Turn your old post into Whitepaper/report/pdf and offer it as freebie to attract more subscribers. In case of older series post that are working well still, you can convert such series into ebook and reposition it as a product to be sold on your website or places like ClickBank, Amazon Kindle. In case you have video's on your site make sure you monetize them too, via AdSense on YouTube. Also make sure to add annotation to your website, subscription page to all your video's. Monetize Pro have done an in-depth article on monetizing different types of content read it up to know more monetization techniques for your content. Mix up your monetization options. Do affiliate with own product, mix it with some Private ad space. Relying on one method only, is calling for disaster. Affiliate might stop, your own product might go through ups and downs of sales, advertisers might flock in or become far and few. Every money making technique has potential of failure and low times. To tide over such troughs, make sure your money making is mixed bag of techniques. So get going and do tell me which monetization method is working best for you. 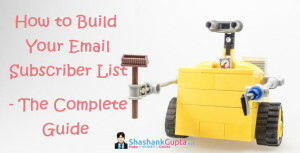 Until next week, when we have a look at how to build email list for your blog.